The management of appendiceal mass remains a matter of major controversy in the current literature. Currently, initial nonoperative management followed by interval appendectomy is favored over immediate appendicectomy. However, the necessity of doing an interval appendectomy has been questioned - is it a necessary evil? The present review revisits the above controversy, evaluates the current literature, assesses the need for interval appendectomy in adults, and provides recommendations. 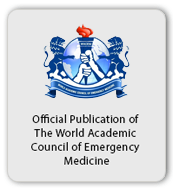 Aim: To survey the literature on Pediatric Emergency Medical Services (PEMS) with an aim to focus its drawbacks and emphasize the means of improvement. Materials and Methods: Published articles selected for inclusion were based on the significance and understanding of literature search on different aspects of PEMS. To meet this criterion, PubMed, PubMed Central, Science Direct, Uptodate, Med Line, comprehensive databases, Cochrane library and the Internet (Google, Yahoo) were thoroughly searched. Results: PEMS provide out-of-hospital medical care and/or transport the patients to definitive care. The task force represents specialties of ambulance transport, first aid, emergency medical care, life saving, trauma, emergency medicine, water rescue, and extrication. Preliminary care is undertaken to save the patients from different medical exigencies. The techniques and procedures of basic and advanced life-support are employed. A large number of weaknesses are recorded in PEMS system, such as ambulance transport irregularities, deficit equipment, lack of expertise, and ignorance of the pre-hospital care providers. These are discussed with special reference to a few examples of medical exigencies. Conclusions: The appointments in PEMS should be regularized with specific qualifications, experience, and expertise in different areas. Responsibility of PEMS should not be left to pre-hospital care providers, who are non clinicians and lack proper education and training. Pediatricians should be adequately trained to play an active role in PEMS. Meetings should be convened to discuss the lapses and means of improvement. Networks of co-operation between pre-hospital providers and experts in the emergency department should be established. Background: Suicide by means of self-inflicted stab wounds is relatively uncommon and little is known about this population and their management. Materials and Methods: Retrospective review of adult trauma patients admitted to our Level-1 trauma center between January 2005 and October 2009 for management of non-fatal, self-inflicted stab wounds. Results: Fifty-eight patients were evaluated with self-inflicted stab wounds. Four patients died due to their injuries (mortality, 7%). Of the non-fatal stab wounds, 78% were male ranging in age from 19-82 (mean: 45 years). The most common injury sites were the abdomen (46%), neck (33%), and chest (20%). In terms of operative interventions, 56% of abdominal operations were therapeutic, whereas 100% of neck and chest operations were therapeutic. When assessing for suicidal ideation, 44 patients (81%) admitted to suicidal intentions whereas 10 patients (19%) described "accidental" circumstances. Following psychiatric evaluation, 8 of the 10 patients with "accidental injuries" were found to be suicidal. Overall, 54 patients (98%) met criteria for a formal psychiatric diagnosis with 48 patients (89%) necessitating inpatient or outpatient psychiatric assistance at discharge. Conclusions: Compared to previous reports of stab wounds among trauma patients, patients with self- inflicted stab wounds may have a higher incidence of operative interventions and significant injuries depending on the stab location. When circumstances surrounding a self-inflicted stabbing are suspicious, additional interviews by psychiatric care providers may uncover a suicidal basis to the event. Given the increased incidence of psychiatric illness in this population, it is imperative to approach the suicidal patient in a multidisciplinary fashion. Background: An assessment of hemodynamic stability is central to surgical decision-making in the management of battlefield ballistic torso trauma (BBTT). Aims: To analyse the utility of admission physiological parameters in characterising hemodynamic stability. Settings and Design: A retrospective analysis of consecutive admissions, with BBTT, to forward surgical facility in Afghanistan. Materials and Methods: The cohorts' admission physiology, need for operative intervention, and mortality data were collected retrospectively. The cohort was divided into patients requiring surgery for Life-Threatening Torso Hemorrhage (LTTH) and those not requiring immediate surgery (non-LTTH). Statistical Analysis: Parameters were compared using two sample t tests, Mann-Whitney, Fisher's exact, and Chi-square tests. Receiver operator characteristic curves were used to identify significant parameters and determine optimum cut-off values. Results: A total of 103 patients with isolated BBTT were identified: 44 in the LTTH group and 59 in the non-LTTH group. The mean New Injury Severity Score ± Standard Deviation (NISS±SD) was 28±14 and 13±12, respectively. The heart rate, systolic blood pressure (SBP), pulse pressure, shock index (SI=heart rate/SBP) and base excess were analysed. 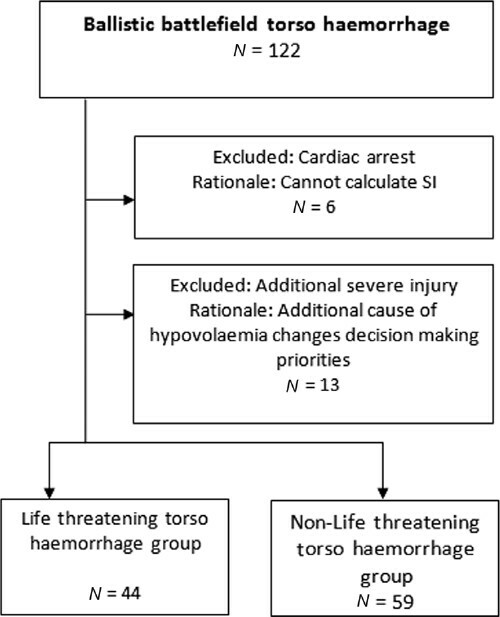 SI correlated best with the need for surgical torso hemorrhage control, P<0.05. An optimal cut-off of 0.9 was identified, producing a positive and negative predictive value of 81% and 82%, respectively. 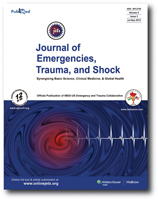 Conclusions: Shock index (SI) is a useful parameter for helping military surgeons triage BBTT, identifying patients requiring operative torso hemorrhage control. SI performance requires a normal physiological response to hypovolemia, and thus should always be considered in clinical context. Aim: To clarify the epidemiological findings and characteristics of ground glass lesions on chest computed tomography (CT) after blunt trauma. Setting and Design: A medical college hospital and retrospective study. Materials and Methods: We retrospectively investigated all blunt chest trauma patients who were admitted from January 2004 to December 2010. The inclusion criteria were patients with: (1) chest CT examination on arrival, (2) intrathoracic traumatic lesions confirmed by initial CT, and (3) a second chest CT examination within 7 days from admission. We divided the subjects into two groups. A GG group included subjects who had ground glass lesions on initial chest CT and a control group included subjects who did not have the ground glass appearance. Results: The average age in the GG group was significantly lesser than that in the control group. The ratio of improvement for the value of SpO 2 /FiO 2 between on arrival and the second hospital day and ratio of improvement for CT findings between on arrival and the second CT examination in the GG group was greater than in the control group. Conclusion: The ground glass appearance on chest CT after blunt trauma was not rare, and the patients with ground glass lesions were younger and tended to have a better improvement of oxygenation and CT images in comparison with the patients without these characteristic lesions. Dental occlusion is key point for proper maxillofacial reconstruction. In this way nasal airway management is extremely important for both oral and maxillofacial surgeons and anesthesiologists. 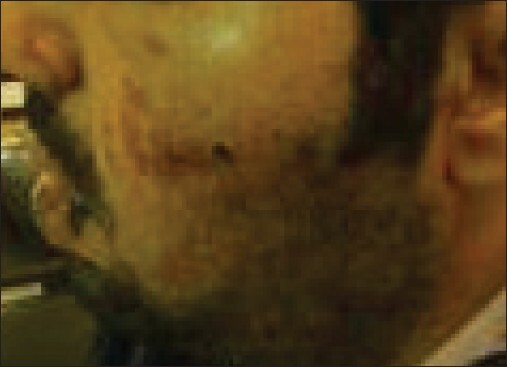 We report a challenging case with severe maxillofacial trauma and nasal obstruction that it managed with a novel anesthetic - surgical procedure. Accurate measurement of temperature is important for detection of fever and hypothermia in pediatric patients. Ideal temperature-measurement technique should be safe, easy, noninvasive, cost effective, time efficient, and should precisely reflect core body temperature. Pulmonary artery is the closest to hypothalamus and best reflects the core temperature. Other sites used are distal esophagus, urinary bladder and nasopharynx. All these methods are invasive and difficult to use in clinical practice. Amongst the noninvasive methods, rectal thermometry is considered to be the closest to core temperature, but it has its own drawbacks. With the current evidence available, tympanic artery thermometry for children more than 2 years of age and temporal artery thermometry in all age groups are taking precedence over other methods. Arachnoiditis ossificans is a rare chronic disorder characterized by the presence of calcification/ ossification of the spinal arachnoid. 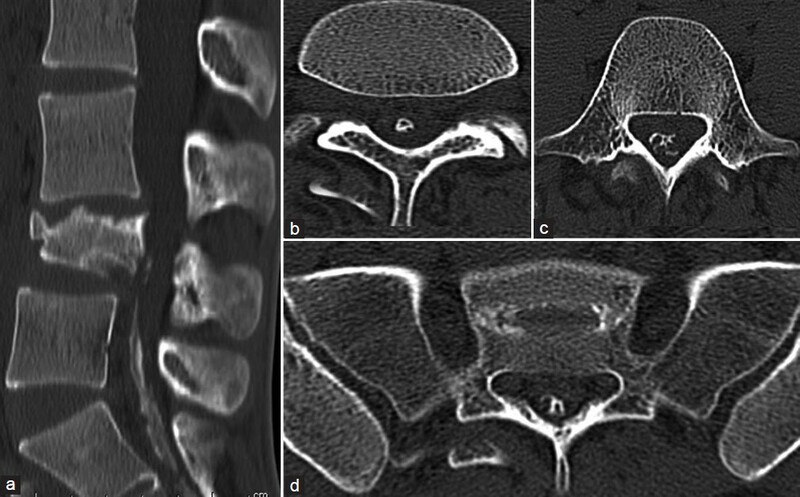 We describe the computed tomography (CT) and magnetic resonance imaging (MRI) findings of arachnoiditis ossificans as sequelae to trauma in a 30-year-old patient. 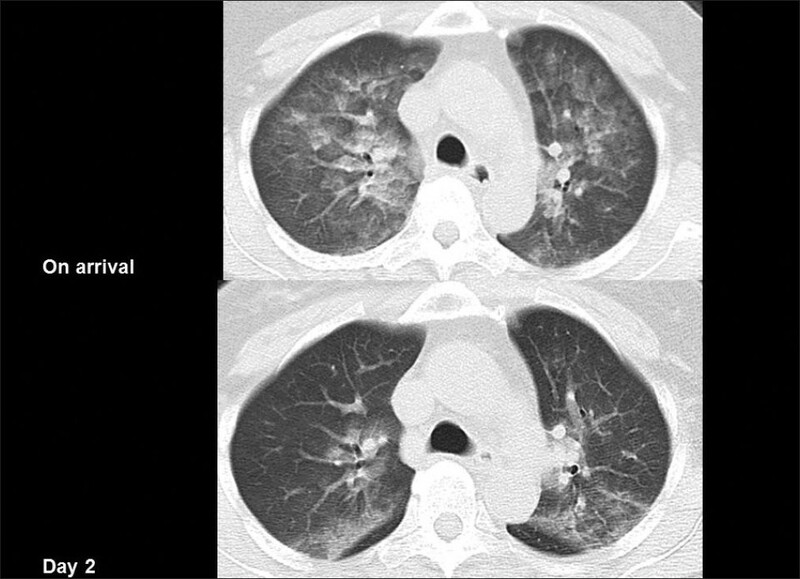 This imaging diagnosis becomes important to alert the clinician as most of them can be treated by conservative management. A male worker entered an underground manure pit and lost consciousness. His coworker tried to rescue him and also lost consciousness in the pit. Emergency service arrived in minutes and removed both of them from the pit. Both men suffered anoxic brain injury and died in the hospital. Cases from Iowa Fatality Assessment and Control Evaluation Program Data Base program were reviewed. 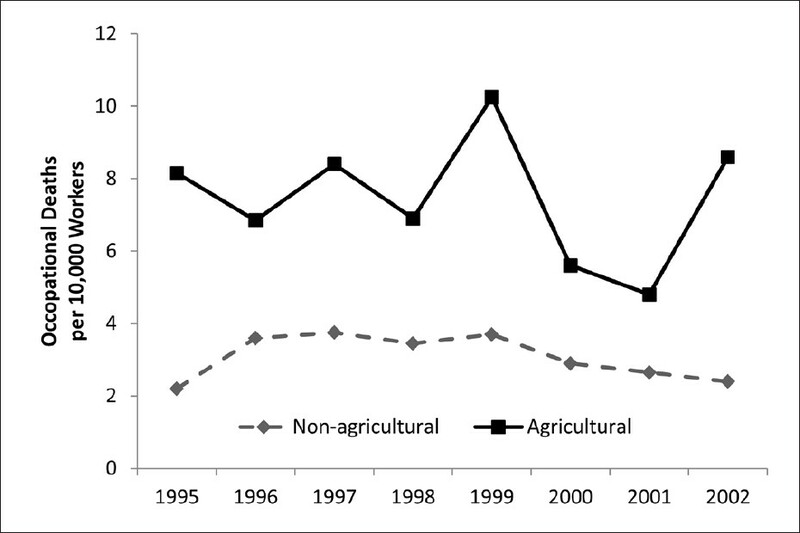 Occupational mortality rate was found to be 7.4 per 10,000 per year for occupational deaths related to agriculture compared to 3.1 per 10,000 per year for deaths not related to agriculture. In most of the cases associated with sewage or livestock waste handling, victims died of asphyxiation. While manure pit injury is rare, it has an extremely high fatality rate. The most effective strategy to decrease mortality is active prevention. Anaphylaxis is a fulminant, unexpected, immunoglobulin E-mediated allergic reaction that can be triggered by multiple agents. Common causative agents include neuromuscular blocking drugs, latex, antibiotics, colloids, hypnotics, and opioids. Fentanyl citrate, however, is an extremely unusual cause of anaphylaxis. 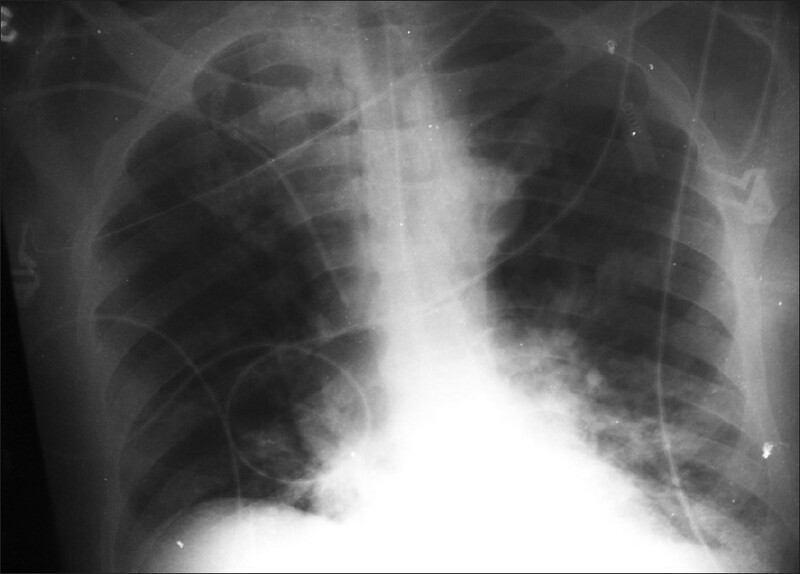 Pulmonary edema, although uncommon in anaphylaxis, can be a prominent feature, as was in one of the patient. An adverse drug reaction is a noxious or unintended reaction to a drug that is administered in standard doses by the proper route for the purpose of prophylaxis, diagnosis, or treatment. Reactions are classified into two major subtypes: type A, which are dose dependent and predictable; and type B, which are not dose dependent and unpredictable. Unpredictable reactions include immune (allergic) or no immune drug hypersensitivity reactions and are related to genetic susceptibilities or undefined mechanisms (formally called idiosyncratic and intolerance reactions). A drug allergy is always associated with an immune mechanism for which evidence of drug-specific antibodies or activated T lymphocytes can be shown. In the last few years, many novel drugs have entered clinical practice (i.e., biologic agents) generating novel patterns of drug hypersensitivity reactions. As old drugs continue to be used, new clinical and biologic techniques enable improvement in the diagnosis of these reactions. Aorto-esophageal fistula (AEF) is a rare and life threatening condition, which can be rapidly fatal. More than half of such cases are secondary to aortic aneurysm rupture. There are only two previous reports describing AEF caused by penetrating atherosclerotic ulcer. We present multidetector computed tomography findings in a case of AEF secondary to penetrating atherosclerotic ulcer. Congenital broncho-esophageal fistula (BEF) may go unrecognized in infancy and childhood and present later in life, due to non specific signs and symptoms. We report an adult case of congenital BEF which was diagnosed after massive aspiration precipitated by raised intra abdominal pressure due to severe acute pancreatitis. Until recently, the treatment of frostbite injuries has been limited to supportive care only, with mediocre outcomes. The use of thrombolytic therapy has been presented in a limited fashion in the literature since 2005. 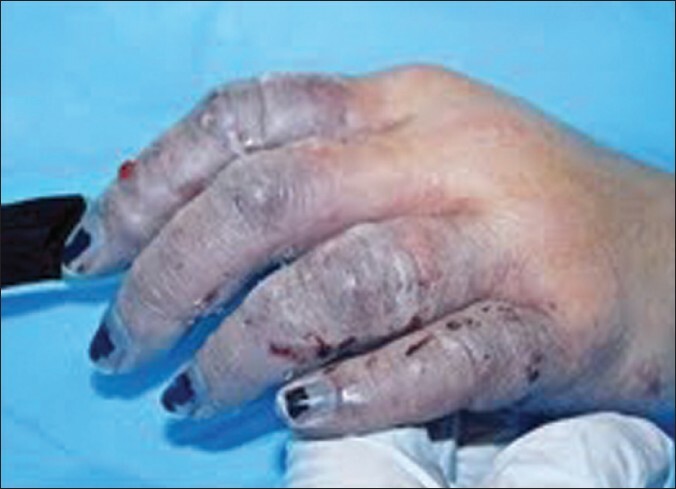 This case study describes the work-up and treatment of a patient with severe frostbite injury who received tPA. We then discuss thrombolytic therapy in more detail, with particular attention to the two studies outlining different treatment regimens. Pulmonary arterial embolization of polymethylmethacrylate cement, most usually occurring after vertebroplasty or kyphoplasty, is very uncommon following vertebral stabilization procedures. 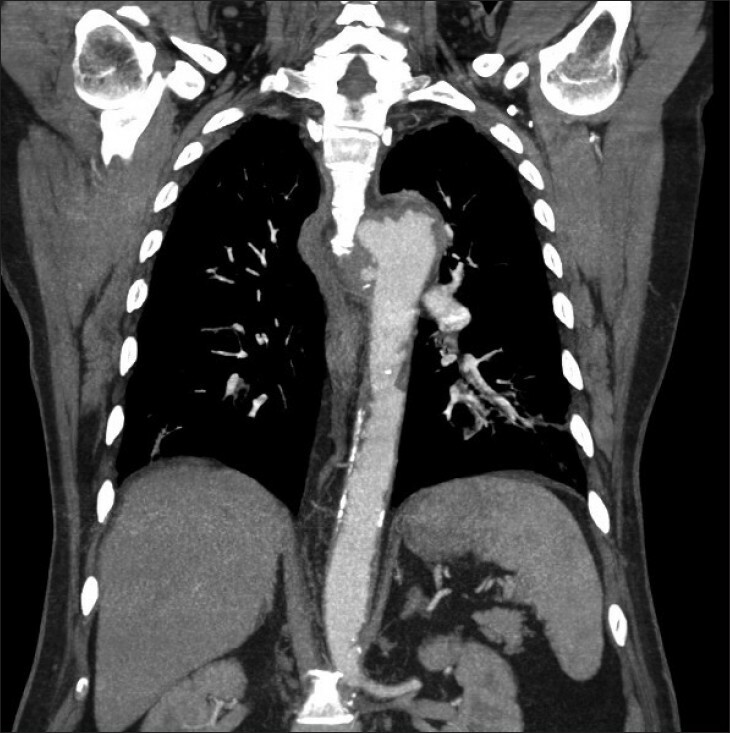 Unenhanced CT scans viewed at lung window settings allow confident identification of cement emboli in the pulmonary circulation along with possible associate parenchymal changes, whereas hyperdense emboli may be less conspicuous on CT-angiographic studies with high-flow contrast medium injection. Although clinical manifestations are largely variable from asymptomatic cases to severe respiratory distress, most cases are treated with anticoagulation. Septic thrombophlebitis of the pelvic veins may occur secondary to non-sterile intravenous drug injection and represents an uncommon yet life-threatening condition, most usually manifesting with persistent spiking fever and limb edema. Risk is further increased in HIV-infected people. 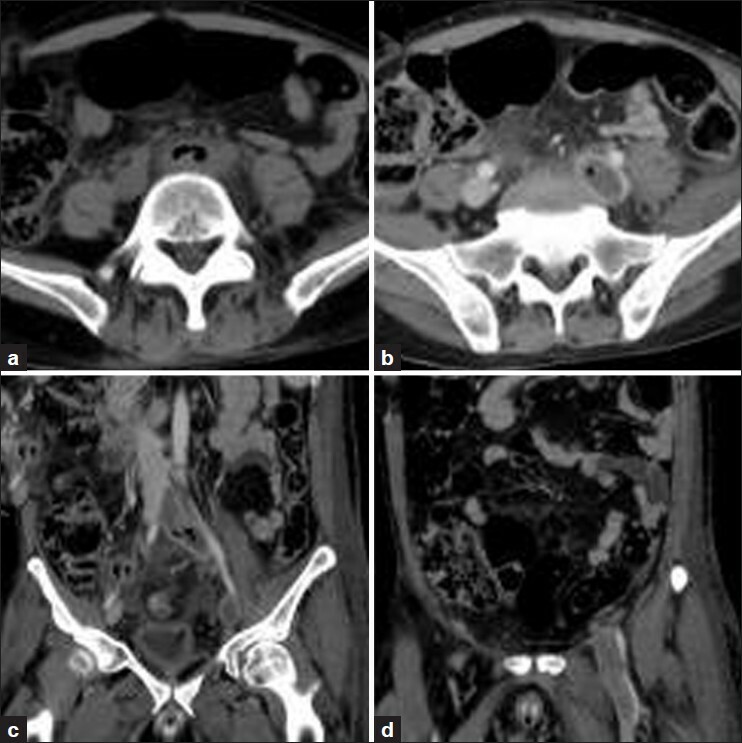 High clinical suspicion and prompt imaging assessment with contrast-enhanced multidetector CT are necessary for correct diagnosis and staging, since early treatment prevents further complications such as systemic embolization.